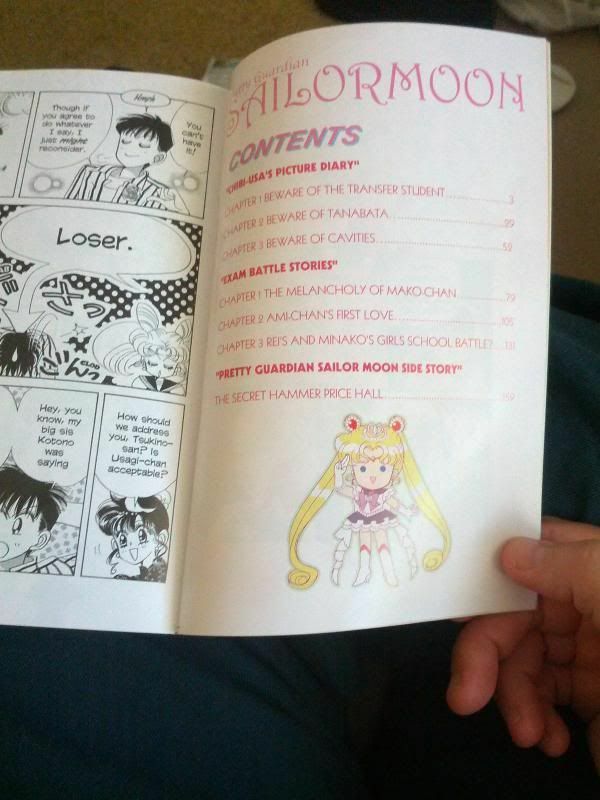 The following are errors that I found in the first printing of Volume 13 (Short Stories 1) of Kodansha USA’s English release of the Sailor Moon manga, which contains the three “Chibi-Usa’s Picture Diary” side stories, the three Exam Battle stories (“The Melancholy of Makoto,” “Ami-chan’s First Love,” and “Rei and Minako’s School Battle”), and the side story “The Secret of Hammer Price Hall.” They are divided into sections for writing errors (presented in a table), possible issues on multiple pages, honorific issues, inconsistencies/continuity errors, and miscellaneous errors (presented as bulleted lists). (p. 64 footnote) Missing a quotation mark: “genius loci=protective spirit” There is no footnote; the term “ghost” is used for the spirit.” Not present in the Miss Dream translation; the term “genius” is used but there is no footnote. Touhi’s speech throughout Exam Battle 1 is very strange and rather stereotypical. The translator chose to go for valley girl speech for Naruru and Ruruna throughout the “Secret of Hammer Price Hall” story, and explains in the translation notes that the speech style they use in the original, kogyarugo, “is probably most analogous to ‘valley girl speak. '” I guess this is not necessarily an error, just a translation choice. The extent of the valley girl speech does come across as very annoying to read, though, but I guess that’s kind of the point. Otakurer, like Touhi, uses very strange speech. The term “Chubster Mask” is used by Makoto Hanmatsuura to refer to his Tuxedo Kamen-esque form on pages 188 and 189 and later on page 195 by Ruruna when she wonders where he went. The actual Japanese term used for the name is Debutcho Kamen or “Chubby Mask.” Not sure where “chubster” came from. “Haruka Big Sis and Michiru Big Sis” (p. 35): While “Big Sis” is a proper translation of what is probably “Haruka-oneechan” and “Michiru-oneechan” in the original, it sounds kinda awkward. The same awkward “Mako-chan-sempai” error seen in other volumes appears on p. 89. Kyuusuke’s Button: On page 5, Kyuusuke claims his brother made his Sailor V button, but at the end of the story (and in the original version) he claims his sister made them. Venus’s Intro: On page 24, Sailor Venus introduces herself as “Pretty Guardian of Love and Justice in a Sailor Suit, Sailor Venus!!”. However, to match the way Venus usually introduces herself, it should be “Pretty Guardian of Love and Beauty,” to match the Japanese title for her, ai to bi no senshi. “Pretty Guardian of Love and Justice” (ai to seigi no senshi) is Sailor Moon’s line. Mercury’s Intro: A similar error to what happened with Venus’s intro on page 24 happens on page 127 with Sailor Mercury. She introduces herself as “The Guardian of Justice and Knowledge, Sailor Mercury.” However, to be consistent with the rest of the Sailor Moon series, it should be “Guardian of Water and Knowledge,” to match the original Japanese title for her, mizu to sei no senshi. Lyrica Hubert’s name is romanized as Lilica throughout the first Chibi-usa’s Picture Diary. The katakana used for her first name is リリカ (Ririka), which could also be romanized as Lilika (as the letters l and r are interchangeable in Japanese), so the translator, knowing this, probably went with “Lilica” for that reason. Miss Dream uses “Lyrica” however, which is probably the better romanization. In “Beware of Tanabata,” the constellations where the stars in the Tanabata legend, Vega and Altair, are located are referred to as the “Lyre constellation” and the “Eagle constellation” rather than their astronomical names, Lyra and Aquila. I understand they wanted to make sure the readers understood the text without needing to know constellation names, but they could have used the astronomical names and then explained the names in a footnote or translation note instead. This volume does not include all the translation notes, due to lack of space. (Something I have difficulty believing from what I know of how books are made, since if they ended up with extra blank pages as a result of allowing space for the notes – a possibility since books, as I understand it, are usually printed in signatures, or sets of 16 pages – they could always sell ad space or something to fill them). You can find the rest of the translation notes at Kodansha USA’s website: http://kodanshacomics.com/sailor-moon-short-stories-1-extra-translation-notes/. The title of the third Exam Battle story, “Rei and Minako’s Girl School Battle,” inexplicably has a question mark at the end in this version (thus reading “Rei and Minako’s Girl School Battle?”).